I love a good lamb curry made from a leftover roast. As there is only 2 of us I usually buy the biggest joint of meat we can afford whenever I feel like making a roast dinner, which isn’t that often, just so that we have plenty of meat for leftovers. It works out a lot cheaper and there’s a lot you can do with the meat. Thanks Jen – this leg of lamb was a bargain. Sadly a pork joint from Sainsbury’s this week has been far less value for money. It cost £8 and we’ll struggle to get two meals out of it because it shrank so much. 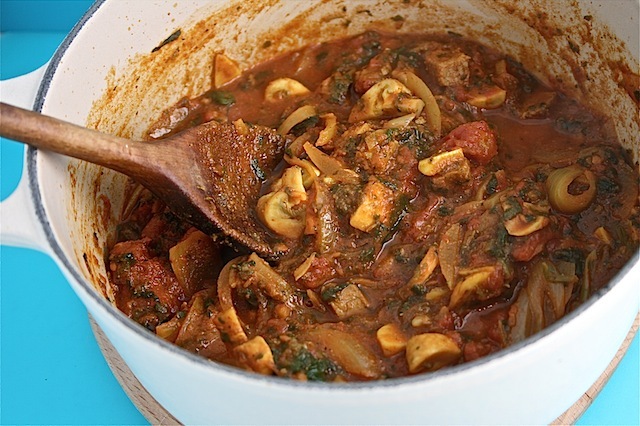 This sounds just up my husbands street, I don’t normally like lamb curry from a takeaway but if it was my own roasted lamb I think I would like it:-)Thanks for entering Credit Crunch Munch with another fab recipe! I can’t believe I’d not done curry with lamb before, I’m definitely adding it to the “regular” list. Lovely tasting and easy to make. Slight ‘typo’error as no mention of how much chillie in the recipe! I added 1green and 1 red chillie ( seeds removed), chopped in blender with fresh garlic. I also added 2 teaspoons of sugar to take the bitter edge off the tomatoes and added 2 fresh vine tomatoes about 10 mins before end o cooking- delicious !! Thanks for that Dianna – I deliberately didn’t say how much chilli as tastes will vary. Glad you enjoyed the curry!